Grabe, sobrang dumadami na tayo! I'm starting this thread so we can map out where our members are and kung gaano na kalawak ang "reach" ng site natin. Of course, through this we'll also find out sino pinakamalapit sa atin na pwedeng kulitin pang mini-EB. hehe. pampadagdag narin sa NCR-South team! oonga, kelan kaya magkaron pinoyviolist.com at pinoycellist.com para mas masaya, bubuo ng mga quartets. ahh honga, di na kelangan ng bagong site, sana dumami din sila dito..
All string instruments share similar form, parts, construction, and function, and the viols bear a particularly close resemblance to the violin family. However, instruments in the violin family are set apart from viols by similarities in shape, in tuning practice, and in history. Violin family instruments have four strings each, are tuned in fifths (except the double bass, which is tuned in fourths), are not fretted, and have four rounded bouts. In contrast, the viol family instruments usually have five to six strings with a fretted fingerboard, and are tuned in fourths and thirds. 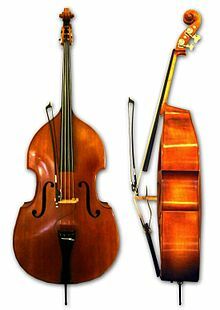 ahhh, perfect 4ths naman double bass, ganun ata ang guitar..